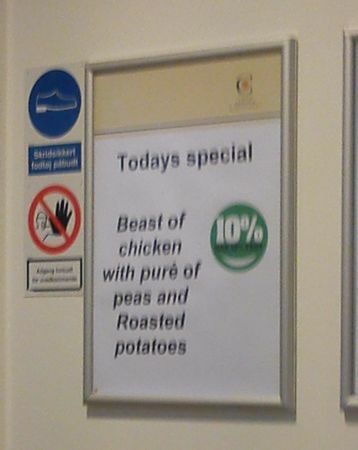 A while back I’ve mocked our work canteen for a dubious and pointless sign they’d put up to describe a dish. It turns out that unintentionally funny signs are their forte. I’m hereby starting what promises to be a recurring theme involving the stuff our canteen comes up with. Whenever I notice one of their odd signs I’ll take a picture and share it right here for your enjoyment. Godzilla's got nothing on those poultry beasts! 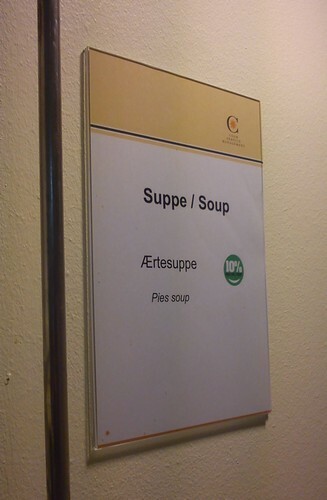 Soup with pies?! That's genius! Imagine my disappointment when all I get in the end is some basic pea soup instead. Way to get my hopes up, canteen! I can only wish that they were talking about a legitimate pie floater. Not only is the chicken a real beast, but the peas are so masculine they get only one “e” when puréed. And the potatoes must undergo some auspiciously important “Roasting” for it to be capitalized! My real question though is, how many “Todays” does this special apply to, since it’s obviously not just “Today’s” special. Keep these posts about your canteen coming. Too funny!